German machine manufacturer Albach refused to compromise and designed a purpose-build mobile chipper from scratch. When most of the mobile chippers for on-site wood fuel production is built on a forwarder or a truck chassi, Albach took a vite paper and draw a new, versatile mobile chipper with flexibility to work with full capacity at landings as well as on terminals. The Scandinavian market for larger wood chippers has been anything but good in recent years. But now there is light in the tunnel? Low inventories and increased demand as new CHP*-plants are built may provide some opportunities for those who sell chippers to the professional users? A new brand at the Swedish market is the Albach from Germany. They builds a mobile wood chipper, which at first glance may be a bit odd. The machine is somewhere between a forwarder-chipper, “terminal terminator” or truck based chipper. It has four big wheels, a 700 hp Volvo Penta engine which powers both the drive line and the chipping drum. It also has a elevatable cabin which gives an outstanding overview for the operator, Albach has drawn up a “purpose-built” mobile chipper from a white paper without having to compromise because of the constraints of an existing base vehicle. 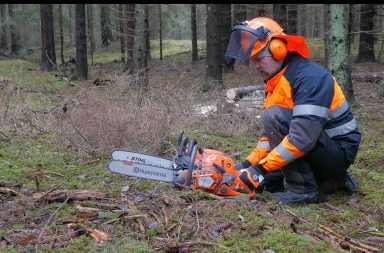 Forestry.com visited the biomass contractor Charles Werninger on a forest road south of Jönköping, Sweden. Charles runs the first Albach Diamant chipper delivered in Sweden and we had a chat about both the Albach and the forest fuel market. We also made a video from the visit (see below). The first thing that strikes me when I see Albach chipper live is that it’s much bigger than I could imagine after seeing it on pictures and videos. A real beast! When the cab is raised in working mode, it looks gigantic. 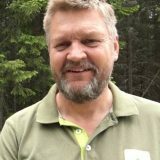 Charles, together with his brother, runs a biofuel production company (Werninger Skog AB) who chipp and transport wood fuel with several own chippers and trucks. 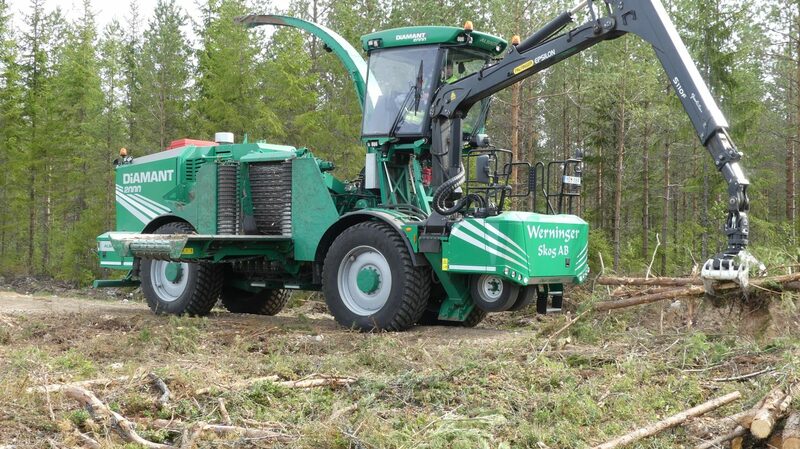 They also have harvesters and forwarders for logging operations. The Werningers produce chips for several companies in southern Sweden. They don’t buy the wood and they never own any of the biomass they produce, they just process and transport. All work are done on contracts and paid by produced and delivered cubic meters. The chips are delivered to the heating plants in the region with transport distances up to 70-80 km’s. in total, the Werningers produce more than 250,000 cbm chips per year. Much of the business is about logistics, and Charles also work as transport manager while driving the Albach chipper. The Werninger brothers drive their own trucks to have flexibility and control of the entire chain. One truck has a big trailer taking 94 cubic meters and they also have a truck handling 40 cbm containers. Deliveries to the CHP- and heating plants are made after daily quotas, which are announced weekly with short notice. Here is the Albach Diamant chipper working at a forest road landing. The most common concept for biofuel production in Sweden. Most of the chipping takes place just like when we visited, at a forest road landing. But sometimes they also chipp at a terminal or directly at the heating plants yard. The mix of operations was one of the crucial factors for Werningers to chose the Albach when they bought the last chipper. -The Albach is quick and versatile to move between different objects and tasks as it can run in 70 km/h on the roads and it has a very short setup time, Charles says. In addition, it has a high capacity that is very useful when it comes to terminal chipping. Werningers Albach has a 700 hp Volvo Penta engine and it weighs just over 30 tonnes. The big wheels, however, gives it better capacity to go further than a truck when it comes to bad roads and poor ground conditions according to Charles. But it has of course not the same capacity in terrain if you compared it with a forwarder mounted chipper . When the Albach is driving on public roads, two extra axels with small wheels are lowered, one front and one back. This is to reduce the axle pressure and cope with the restrictions on public roads. The Albach Diamant has three different engine options to choose from, all Volvo Penta engines. Previously, they had V8’s from Mercedes Benz but Albach have now chosen to only use Volvo engines instead. Werninger’s Albach chipper has a 700 Hp Volvo Penta engine. 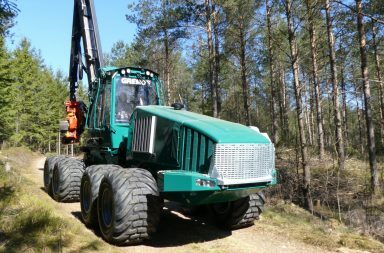 According to the Albach company, they will show an upgraded Diamond 2000 chipper at Elmia Wood 2017. With larger engines and some changes in cutting angles and output facilities, the capacity will be increased with some 10-15%. When I looked at the chipping, Charles handled a semi delimbed assortment of wood from thinning. 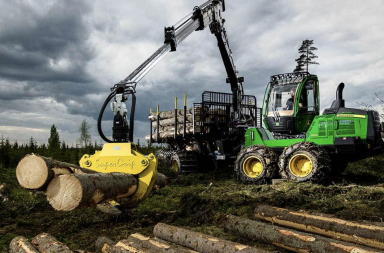 It is a thinning model where a multi tree handling harvester is used. Instead of total delimbing of the stems, they branches are just “broken” and pressed together. This gives significantly higher percentages of solid wood in the stack than i e a slash pile. I checked the time to fill up a 40 cubic container and it took exactly 6 minutes and 43 seconds from empty to full. In Werninger’s logistics, it’s hardly not the chipping as the bottleneck, but as always the transport flow. However, the high cutting capacity is excellent to have when it comes to terminal operations. The price level for a new Albach Diamant 2000 in Europe is some where around Euro 600 000. A price that Charles considers to be clearly competitive compared with other solutions such as forwarder- or truck chipper. The Swedish Forestry Research Institute, SkogForsk has done a test of performance and fuel consumption on the Albach Diamant 2000. The result from it can be found here (only in Swedish). Without having my own experience of driving any bigger chipper, Albach’s machine design seems very thoughtful. The view from the cab and the working environment inside is really good. The operator has a superb overview of a large work area from the high position. “At first, it was hard to know where the ground level was when i start to work with the crane,” laughs Charles. It took a while to learn and there was some “soil scarification” before I get used to work from this high position. Then he shows me a lot of smart and practical solutions with toolboxes and compartments that are not available anywhere. Charles thinks the Germans are reluctant to think of everything. “But they are not on the LED lights yet, so we got to upgrade ourselves,” he says, climbing the cab to roll away and meet the next truck and fill another load of wood chips. More information about the Albach chippers can be found here at their web site. Bright market for forest fuel? The market for wood fuel in Sweden has been poor in recent years. Large competition from imported municipal garbage, recycled wood and warm winters has resulted in stagnation and decline of wood fuel volumes. Many wood fuel contractors have suffered and some have been forced out of business. Now, however, it looks brighter with new heating plants that already have started and others who are under construction and soon ready to start. In addition to this, larger CHP plants are planned in the Stockholm-area. The cold spring in Sweden has also contributed and it’s a fact that wood fuel stocks are now at a record low level. Bette years to come and good timing for Albach? *CHP = Combined Heat and Power production plant. A facility that produces both heat and power. CHP-plants is used in combination with a district heating system and they are very common in Sweden. Most of them are fueled with forest and wood industry residues as slash and wood chips. Many of them also use municipal waste or recycled wood. You can read more about CHP plants and use of biofuel from wood at the Swedish Bioenergy Associations site.